A former school cheerleading coach has defended his coaching techniques after leaked videos of girls screaming in pain while being forced into the splits have gone viral. Ozell Williams, who taught at East High School in Denver, was subsequently fired for his coaching methods—but he denied that he had done anything amiss. “What am I hiding from? What am I hiding for? I didn’t do anything wrong,” Williams told CBS4 during a 4-hour-long interview. He said prior to the stretches, he had explained to the students that being able to perform the splits was necessary as a cheerleader, but the exercises to hold the splits for 30 seconds were voluntary. He added that none of the students declined to participate. “Split stretches hurt, so therefore, they knew that this is going to hurt,” Williams told the news station. “I also explain what type of pain will come with it. “We made a vow to hold each other to stay in that split stretch. If they didn’t want to do it, all they had to was say ‘no.’ No one intimidated them into doing the split,” he said. Williams said the videos looked bad as they were taken out of context and apologized for the videos being leaked without context, CBS4 reported. “That part of the video looks bad, and I apologize for that,” Williams said. “What happened was wrong. Under no circumstances should a young person be in a situation where they are suffering physical or emotional harm. Under no circumstances should a young person be forced to continue any activity beyond the point where they have expressed their desire to stop,” Boasberg said at a press conference on Aug. 25. The Denver District Attorney office said in a statement on Oct. 14 that it will not be filing criminal charges in connection with the cheerleading incident but did not approve of the technique. “The message should be clear that this type of technique has no place in high school cheerleading coaching. The bad judgment of the coach, however, does not constitute a prosecutable crime,” the statement said. 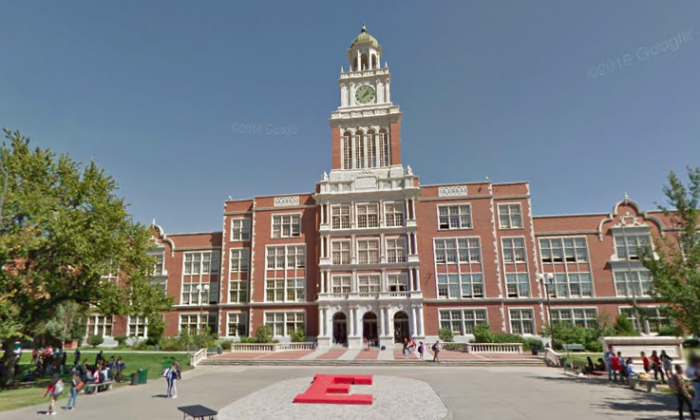 East High School principal Andy Mendelsberg retired and the athletic director resigned over the incident, according to the statement.